The Binoptometer 4P is a professional screening instrument for testing all relevant visual functions. The used future-oriented technology allows an almost unlimited representation of various vision tests. Large selection of colour plates according to Ishihara and Velhagen-Broschmann colour test plates. The display is calibrated to the exact colour temperature, thus guaranteeing ideal colour rendering. The binocular vision tests are generated by a modern LCD shutter system, which is very similar to natural visual conditions. Furthermore, a variety of stereo-vision and phoria tests guarantees a reliable evaluation of the binocular vision functions. A program for testing contrast sensitivity under photopic conditions is also integrated. The contrast sensitivity test can be conducted at various visual acuity levels with Landolt rings, letters and numerals as options. 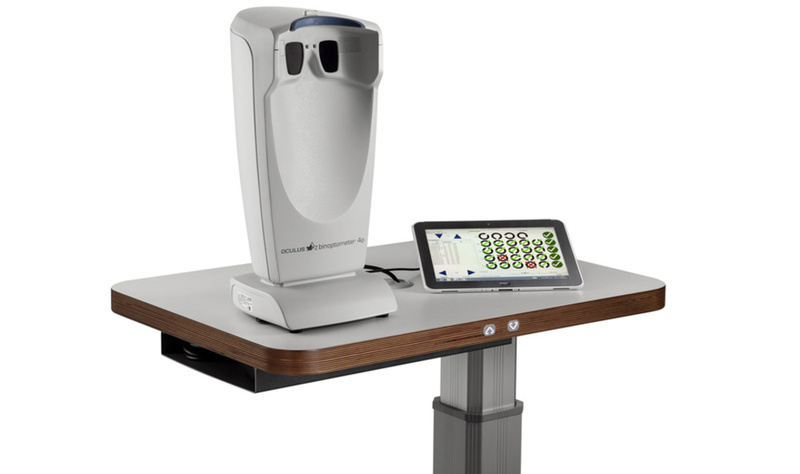 The visual field is tested at seven visual field locations at the right and at the left. Fixation control is done by means of a changing fixation mark in the center of the test screen. If asthenopic symptoms are present or if the visual acuity values are abnormal, the additional corrective lenses in the range of +4.5 D to -3.5 D can be used to determine whether an undetected (latent) hyperopia (up to +1.5 D), an age-related long sightedness (presbyopia) or myopia, especially night myopia, exist. Measurement of the range of accommodation can be a valuable tool for deciding whether special eyeglasses for computer users are needed. The Duane test figure makes a speedy and informative measurement possible.